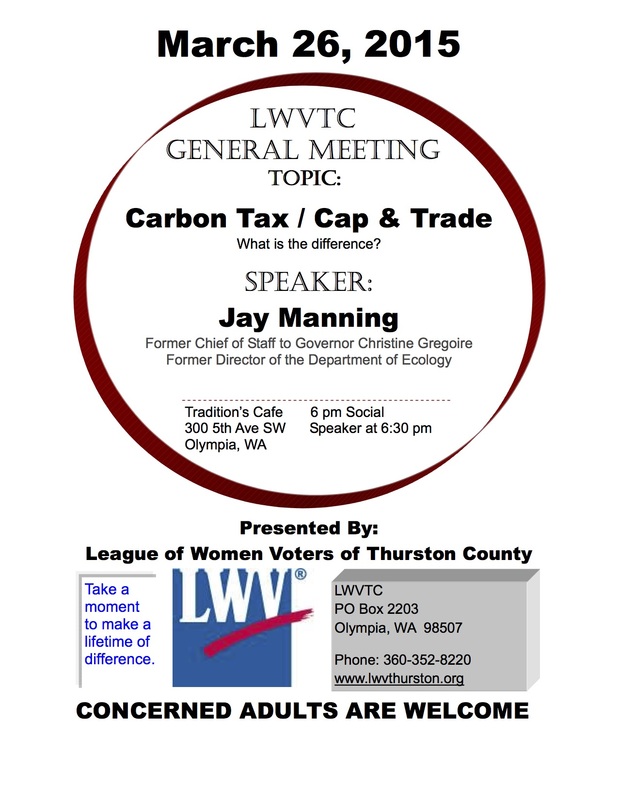 The League of Women Voters of Thurston County general meeting topic for March 2015 will be Carbon Tax / Cap & Trade. The meeting will be held on March 26, at Tradition’s Café in Olympia. There will be a 6 p.m. social with the speaker at 6:30 p.m.
At the public program on March 26 , we will be focused on educating our members on the difference between a carbon tax and cap and trade. Knowing the details of both these efforts is crucial to understanding how we can slow down the impeding environmental disaster of global warming. Almost all of us hear these terms regularly but many of us don’t really know the difference or the methodology between cap and trade. Our speaker will be Jay Manning, former Chief of Staff to Governor Christine Gregoire, and former Director of the Department of Ecology. He currently works for Cascadia Law Group, a leading environmental law firm. We are excited that Jay Manning will be joining us to fully explain the Governor’s approach to a state carbon tax, the methodology behind a cap and trade system, and what is happening up in the legislature with both approaches. Who supports such as a system and who is opposed and why? Come and join us so that you can learn and help us advocate for a cleaner healthier environment!